The Pope is visiting Washington, D.C., and President Bush takes him out for an afternoon cruising on the Presidential yacht. They're admiring the sights when, all of a sudden, the Pope's hat (zucchetto) blows off his head and out into the water. Secret Service guys start to launch a boat, but President Bush waves them off, saying, "Wait, wait. I'll take care of this. Don't worry." Bush then steps off the yacht, walks across the water to the Holy Father's little hat, bends over, picks it up, and then walks back to the yacht and climbs aboard. 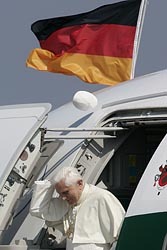 He hands the hat to the Pope amid stunned silence. Does God Exist? How to Argue Convincingly! Does God Really Exist? How to Argue Convincingly! Since the dawn of time people have sought to answer the big questions: Where did I come from? Why am I here? Where am I going? Can any of these questions really be answered? A classic example of these questions is expressed in Gauguin’s painting entitled, “Whence, What, and Whither?” No honest person can ignore these questions and still consider himself thoughtful. In the area of life and existence, and how life came into being, there are only three possible explanations of origins. 1. Everything sprang out of nothing. 2. Existence and life originated from an impersonal source. 3. Existence originated from a personal source. For the rest of the letter, click here. For more such articles and letters, click here. I am so excited! I decide to "go out into the deep" as our beloved Pope John Paul II asked of us and try to form a study group based on your Footprints of God series. The fist session was tonight. Four of us had our bibles, the Catechism, your study guide, and took the Moses DVD chapter by chapter. We took turns looking up all the verses you referenced in the study guide. My goodness, we positively felt Protestant! The participants were blown away by the dvd. They can hardly wait to see David/Solomon next. We were together three hours. We had a blast!